The two speak about potential benefits to the middle class and small businesses at an event that draws about 250 mostly Republican invited guests. BIDDEFORD — President Trump’s eldest daughter teamed up with Maine’s senior senator Friday in an effort to build support for the Republican tax reform plan at a forum attended by an invitation-only crowd of about 250 people. Ivanka Trump, a White House adviser to her father, appears to have built a relationship with Sen. Susan Collins, R-Maine, around common political goals as they pertain to taxes and working families. Collins introduced Ivanka Trump and said she had grown to know her as a “passionate advocate for working families and women.” The two women have met several times at the White House, a Collins spokeswoman said. In an hourlong presentation, the two spoke about the need to simplify tax filing and help the middle class. They also appeared focused on bringing a tax break to small businesses like the cardboard box manufacturer where they appeared, Volk Packaging. “The stated goal is twofold: enable our businesses to be competitive and thrive, and to provide meaningful tax relief to middle-income families,” Ivanka Trump said of the tax reform effort. Collins said she supports efforts to reduce the top tax rate for corporations in the United States. She said that move would encourage the return of companies that have left the United States in order to shelter their profits offshore, and bring more jobs and investments. U.S. Treasurer Jovita Carranza also appeared with Trump and Collins in an event that offered no opportunities for unscripted interactions. The three women were asked a series of questions by moderator Nan Hayworth, a former Republican congresswoman from New York who also read four questions that were selected from those submitted by the audience, including one to Ivanka Trump on what it takes to be a successful female entrepreneur. The Maine meeting came just after Republicans in the Senate unveiled key components of their tax reform package, which differs slightly from tax reforms passed by Republicans in the House in October. However, key provisions in both pieces of legislation include increased standard deductions, streamlined filing and a slashing of the top federal corporate income tax from 35 percent to 20 percent. But details in the Senate bill, released Thursday, show it would fully repeal the state and local tax deduction, an approach that has drawn strong opposition from House Republicans in New York and New Jersey and resulted in a compromise in the House version of the bill that would allow property taxes to be deducted up to $10,000. The House bill also caps the mortgage interest deduction, an idea that caused intense blowback from the real estate lobby, but the emerging Senate tax measure would leave it unchanged. That means home buyers would continue to be able to deduct interest payments on loans of up to $1 million as permitted under current law; the House bill would reduce the limit to $500,000. In a change sure to cause another quarrel, the Senate measure includes a one-year delay in changing the corporate tax rate from 35 percent to 20 percent. Postponing that reduction would lower the cost of the bill to the Treasury, but the delay is opposed by the White House and some Senate Republicans. Collins seemed to acknowledge that a final tax reform package that could garner support from Republicans in both bodies, let alone Democrats, was far from a done deal. The line drew a round of applause from the audience, who were invited to attend by Collins, Volk Packaging, the Maine Republican Party and the White House. Among those present were the executive director of the Maine Republican Party, Jason Savage, Maine Senate President Mike Thibodeau and dozens of other Republican lawmakers. Thibodeau is among four candidates in the Republican primary for governor in 2018. 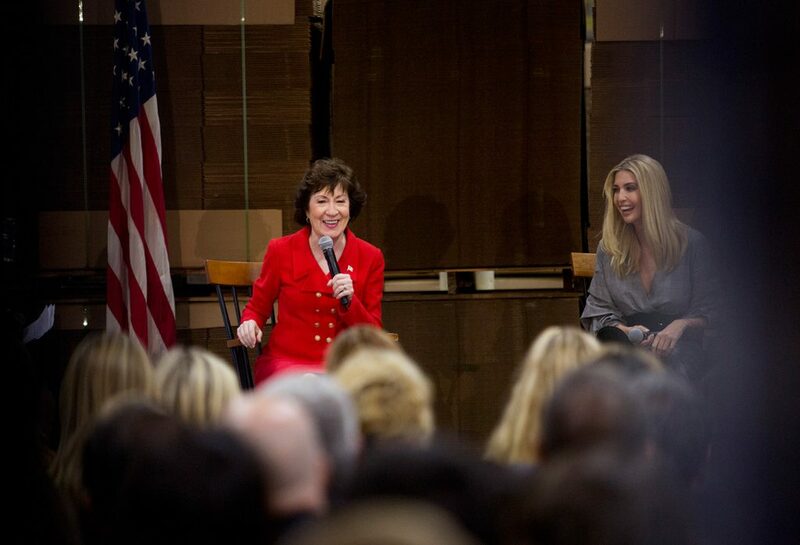 Ivanka Trump and Collins have met several times in Washington to discuss issues that affect working families, said Annie Clark, Collins’ spokeswoman. Clark said the forum in Biddeford was a result of those meetings. “(Ivanka) wanted to come to Maine and we were happy to have her,” Clark said, noting that the event was largely orchestrated by the White House. Outside Volk Packaging, a handful of protesters gathered, including several from Mainers for Accountable Leadership, saying they wanted to urge Collins to reject provisions of tax reform legislation now before Congress that they contend will mostly benefit the wealthiest Americans. Holding signs that read “Susan says let them eat cake” and “Not one penny in tax cuts for the rich and corporations” and other slogans, the group stood in the cold wind outside the forum. “We need to explain to people what’s in these tax bills and we need our representatives to say, ‘no,'” said protester Susie Crimmons of Portland. Collins has been a frequent critic of the president and his administration, and during the 2016 election campaign she said she wouldn’t be voting for him. She also has opposed the Trump administration’s efforts to repeal and replace the Affordable Care Act and has been among three hold-out Republicans in the Senate on the issue. Collins is a key and coveted vote in the narrowly divided Senate, where Republicans hold just a two-seat advantage over Democrats, and her vote is likely to be a major factor in any federal tax reforms Republicans hope to push through. Ivanka Trump has been promoting the tax reform package, which she says would help working families. She has also been an advocate for paid family leave for new working mothers. Carranza, the 44th treasurer of the United States, oversees the Bureau of Engraving and Printing. She is a former deputy administrator of the Small Business Administration in the George W. Bush administration. Ivanka Trump’s appearance at the forum Friday drew criticism from Maine Democratic Party Chairman Phil Bartlett.